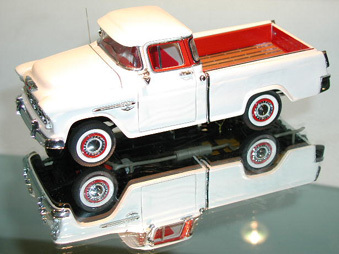 This model features open doors, hood, tailgate and operating steering. The Franklin Mint diecast cars in this collection were purchased directly from Franklin Mint and immediately placed into storage in Virginia where the models spent most of their life, until relocating to Florida. Most models were never removed from their styrofoam. The paint finish is glossy, like-new. Vinny's Used Cars will offer those models with mild paint rash. Most of the models have their original plastic module inside the styrofoam (if the model originally came with it) and packing material. Most models include papers. See the description below. The original outside boxes are in very good condition with black marker writing.